"The instrument was newly built in 2007 for the church of our Lady in Adergas (Velesovo, Slovenia). The place belongs to the important pilgrim churches of the area. Former monastery was transformed into a spiritual centre, where groups or individuals may find refuge and spend days in silence and meditation, and enjoy the surrounding beauty of nature and giant mountains. 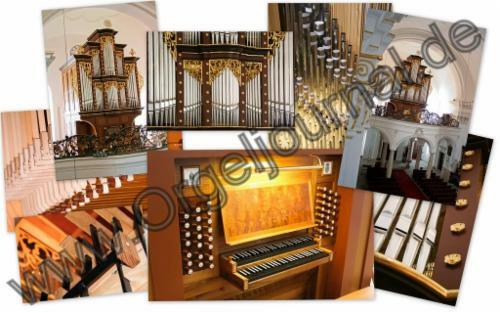 In March last year I had the pleasure to see and play the new organ in the parish church of Velesovo built 2007 by Orglarstvo Mocni/Tomaz Mocnik. I was there just about an hour, but I remember that I found the intrument most satisfactory in all aspects. The case reflects in a beautiful way the style of Gottfried Silbermann and Zacharias Hildebrandt in Sachsen in the first halft of the 18th century, the period when J. S. Bach was active in the area. The large and carefully choosen specification is a sort of a mixing of these two builders style, but with emphasize on Silbermann. I remember the action to be sensitive and direct in the way you really wish for the baroque repertoire. The voicing is of very high class with a wealth of different characteristic flue stops, individual reeds and brilliant plenum sound for the large works by Bach. It was possible to find registrations for all kinds of pieces in this repertoire. For me it was one of the best and most delicate new organs in the style we can call “Bach-style” I have played. It is just a pity it is so far away! Last year I got myself an house organ built by Tomaz Mocnik. It is placed in a rather small study room (38 square meters) but voiced in a way that suits the room perfectly. I see it as something of a miracle that it is possible to voice an organ with 13 sounding stops so delicate and soft, still keep the right character of the differents stops and get it to sing in the small and acoustically dry room. The action is absolutely perfect, I can play and enjoy an enormous large amount of repertoire in different styles, and for me it is a dream organ with a quality in all aspects you rarely find anywhere. I find the organ in Velosovo very well concieved and realized. The sound is powerful and well balanced beetwen different keyboard. The richness of stops make this instrument very appropriate to Bach organ music and I enjoyed playng it. leider haben wir uns letzte Woche nicht in Slowenien gesehen und so möchte ich Ihnen auf diesem Weg meine Hochachtung und Bewunderung für die neue Orgel in Velesovo zum Ausdruck bringen. Zwar ist das Instrument noch nicht fertig, es fehlen noch einige Zungenregister und die Intonation ist noch nicht abgeschlossen. Dennoch zeichnet sich bereits jetzt eine Qualität ab, die keinen internationalen Vergleich zu scheuen braucht: die Prinzipalchöre sind ausgewogen und transparent, die achtfüßigen Labialregister klingen charakteristisch und sind mischfähig, die Zungen sind rund und passen ideal in den Gesamtklang. Die Traktur ist hervorragend präzise und mit einem guten Druckpunkt ausgestattet. Auch nach drei Tagen Kurs wollte man das Instrument immer noch weiter hören. Es war eine Überraschung für mich, daß Ihre Entwicklung als Orgelbauer eine solche Steigerung erfahren hat und ich gratuliere Ihnen herzlich zu diesem großen Aufschwung in der Qualität.